New Account Savings! Right On The Beach & Just Steps to the Sand! 'MAUI RIGHT ON THE BEACH' DELUXE 'Lucky' is the guest who spends their Maui holiday in this nicely remodeled and well appointed condo. AT THE HONO KAI RESORT 'ON THE BEACH' One of only 2 complexes that have full beach front access. SHOULD BE ON YOUR BUCKET LIST! A HEAVENLY LOCATION...Considered a garden/parking view condo retreat right on the beach. Not beach front but nestled a few doors back yet still only steps to the sand. Great value! (approx 5 miles of sugary golden sand to enjoy). Complex is small, quiet and uncrowded. Stroll along the the longest sugary beach on Maui (also uncrowded!) At the beach you can swim, play, snorkel, boogie board or just relax and soak up the warm sun and enjoy a peaceful view from the beach of the breathtaking Maalaea Bay, the grand volcano Haleakala and the sparkling Kihei lights at night. 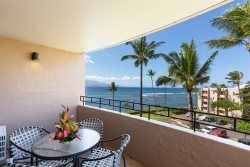 Breath in the fresh ocean air and feel the tropical cooling breeze while sipping Mai Tai's on your lanai or even better out front by the beach side pool and bbq area. The entire condo is tastefully decorated and nicely remodeled with the spirit of Aloha in mind. Bedroom suite provides a comfy king bed. Wall a/c to keep you cool and comfortable while you slumber. Remodeled bath with tiled walk-in shower, free secured wifi, internet, cable, telephone. Kitchen is very well stocked for the cook in mind. Shared laundry facility is clean and and there is one located on each floor conveniently located near-by your door. Other coveted amenities to enjoy are of course the beach side pool, very nice and inviting bbq and dining area, pool side lounges. The condo was perfect. Most comfortable bed ever! Better than home! Perfect size for two. 3 great restaurants within walking distance!